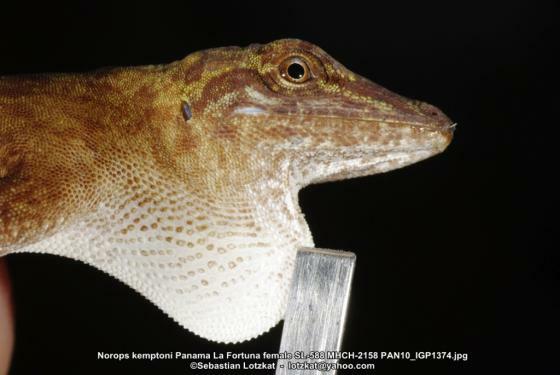 Can you confirm these amateur observations of Anolis kemptoni? 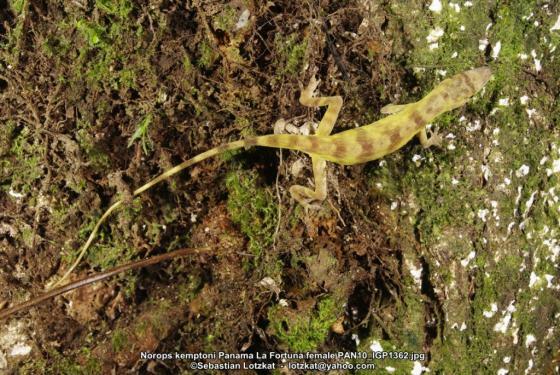 Type locality: Finca Lérida, Chiriquí, Panama, 5300 ft. elevation. pandoensis: Costa Rica (Cordillera de Talamanca), Panama; Type locality: Costa Rica: Puntarenas Province: Cantón Coto Brus: Zona Protectora Las Tablas: La Changuinolita, elevation 1950 m.
Diagnosis Diagnosis (pandoensis): A small, yellowish-tan, short-legged member of the Norops fuscoauratus species group characterized by having enlarged postcloacals and a large, bicolored pink and orange dewlap in males and a small, plain dewlap not contrasting in color with the rest of the throat in females. [from SAVAGE & GUYER 1998]. 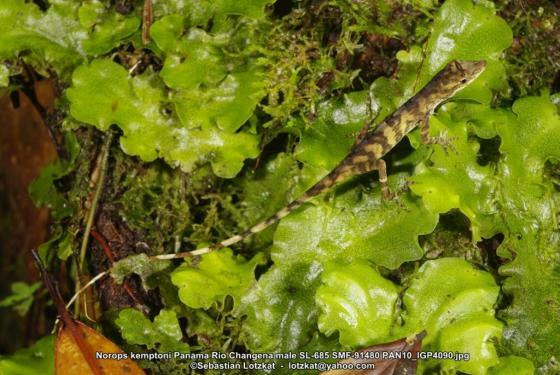 Comment Norops pandoensis has been synonymized with N. kemptoni by HULEBAK & POE 2006. 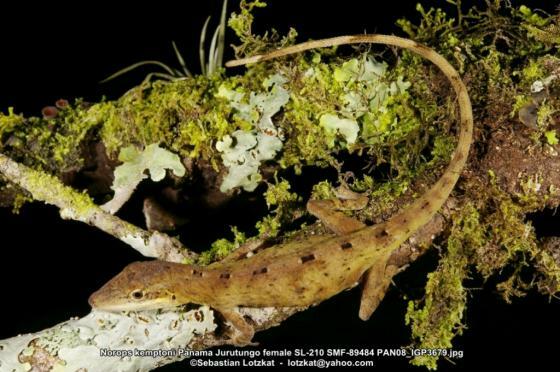 Comparisons: N. pandoensis is a member of the fuscoauratus species group. 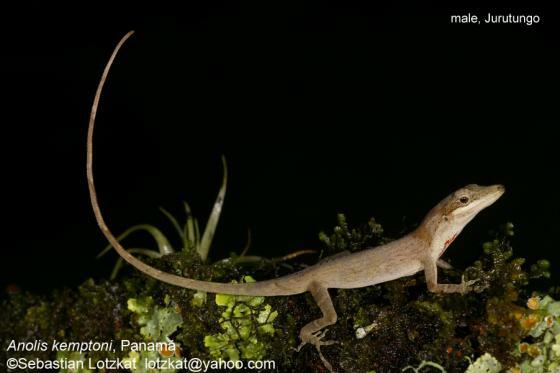 Lizards of this group are small to moderate in size, have small head scales, small dorsal scales, mostly smooth ventrals, long tails that are round to subcylindrical in cross-section. 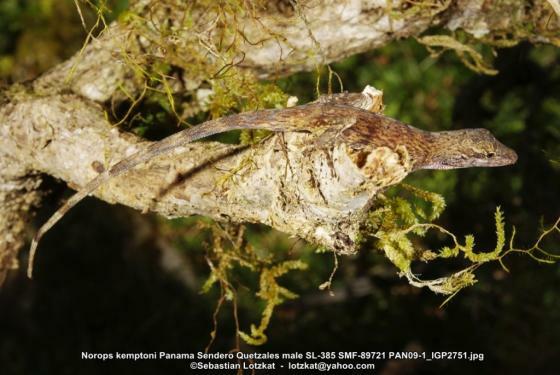 Members of this group usually have an inscriptional rib formula of 3: 1 (Etheridge, 1965) as is the case with N. pandoensis. 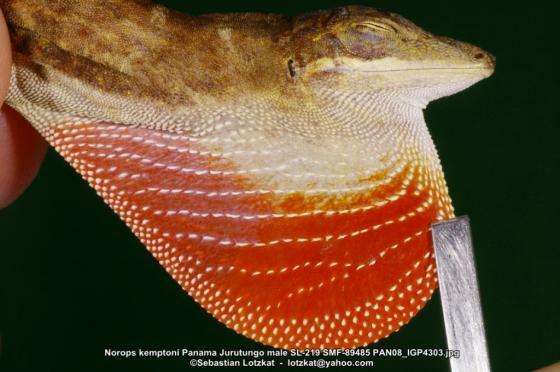 Among Central American members of the fuscoauratus group the new species is unlikely to be confused with Norops limifrons (including N. biscutiger) or Norops polylepis both of which have long legs, i.e., the tip of the 4th toe reaches beyond the orbit when the leg is adpressed along the side of the body. 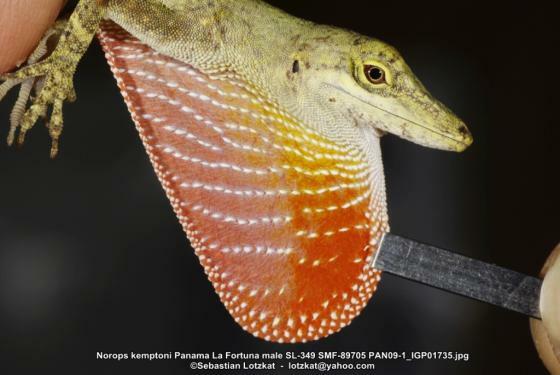 In addition, the dewlap in male N. limifrons is white with a basal yellow to orange spot and is uniform orange in male N. polylepis. 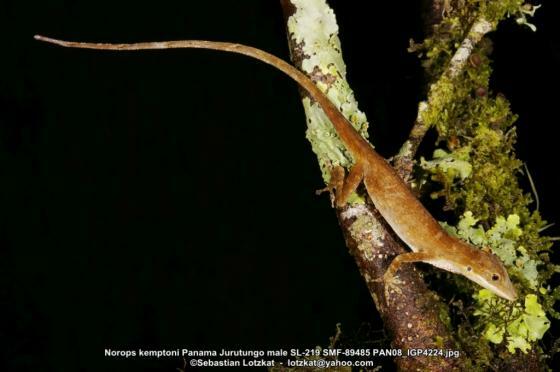 Among short-legged members of the fuscoauratus group, N. pandoensis can be distinguished immediately from the lowland Norops carpenteri which is green, smaller (standard length 35-45 mm) and with a uniform orange dewlap color in males. Comparisons with the four short-legged species most similar to N. pandoensis in general appearance are summarized in Table 1. All are upland forms and one or more of them may prove to occur sympatrically with N. pandoensis. [from SAVAGE & GUYER 1998].